awesome photo!! she looks very stylish and cool. Ack, I just love this outfit of hers! omg, looove her style, except the color of her hijaab doesn't really fit with her outfit.. but for the rest I looove it! thank youuu so much Hijabs High! I totally love this photograph - I love her pose, her attitude and the waist-coat detail. LOVE IT! And I'm not following her blog. How cute! i think wearing the colorful hijab is a smart choice since she wear a neutral colored outfit. love the boots! and the blazer too! and the vest! and the geeky glasses! oh i love it all! She is so unique! I would definitely take this girl shopping with me - maybe she could save me from my boring self! It's a good choiche to take such a colorfull scarfe with this 'chic'- outfit! gotta love the entire ensemble! very chic! Check those boots!!! Wow! Luuuurve the scarf! I love how she puts her glasses in her scarf instead of directly on her ears. Its a very beautiful detail. Mash'Allah. ohhh i'm loving her whle look, neck to toe! 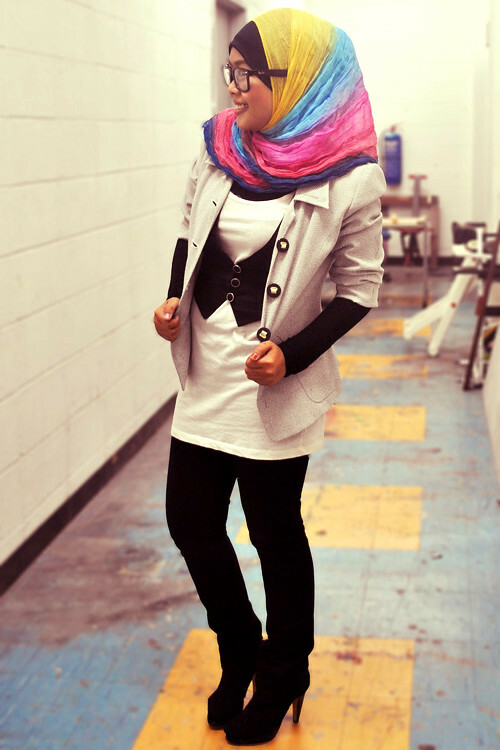 well, i don't get the full coloured hijab though, but i want that outfit..